At the conference you have plenty opportunity to learn about new innovative treatments and prevention using computer games. You can test them and experience how they actually work. During the many workshops and presentations you can meet other stakeholders, such as medical scientists, game developers, physicians and nurses. Your presence and activities can be the basis for new ideas and collaborations and can contribute to a transformation of healthcare. We are very happy to receive you at the conference. Please tell us more about yourself and your interests, so we can help you better. Since its first edition in 2011, the Games for Health Europe Conference has been the largest conference of its kind in Europe, attracting over 400 highly committed participants from across the world who present research and games, engage in interactive workshops, share information and create new opportunities. 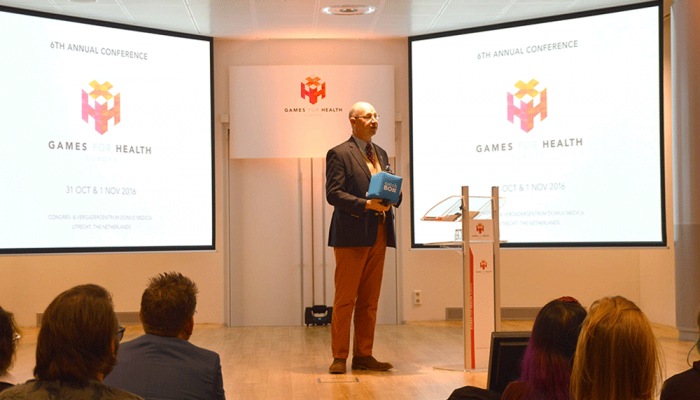 The full range of stakeholders in games for health will be present at the conference, including game developers, doctors and nurses, scientists, healthcare innovators and thought leaders. Engage in discussions, refresh your knowledge of the field and find partners for collaborations! The conference provides ample opportunity to meet game developers and find out what they have been up to. You can find out about exciting new technologies and approaches, try out the latest games and get inspired. Although patients are enthusiastic about games for health, some care professionals are not convinced they actually work. We asked all contributors to the conference to pay special attention to validation and provide opportunities for participants to try things out. Come and experience that games for health really work! The combined fields of healthcare and gaming are complex and involve a large and diverse array of stakeholders. True innovation and transformation are only possible if these stakeholders understand each other’s roles and needs and collaborate towards a common goal. Your input is invaluable!